If it wasn't for science, you wouldn't have the device you're reading this article on or your robot butler that's shaped like a panther. I think we all pretty much agree that science is great. That said, science is also completely effing terrifying. For every vaccine and useful new app that makes fart noises, there's a scientist out there who apparently never watched The Island Of Dr. Moreau. They conduct research and perform experiments that seem a little more at home in Frankenstein's lab than any place in the world. Essentially some people have turned real science into real horror. The reason people are put on edge by movies about massive pandemics is because that's too real. We had an Ebola scare a few years ago, there was SARS and H1N1 ... no one wants to wake up one day with blood leaking from every hole and the news telling us, "Cancel your plans for this week. Society was fun while it lasted." The world has been decimated by disease many times in the past, and no one wants it to happen again. But that didn't stop researchers from actually resurrecting the Spanish Flu, a disease that took out at least 50 million people in 1918. Like any deadly flu, the Spanish Flu seemed to mutate quickly from a much less deadly strain into a waking nightmare. But the exact way a virus like that spreads throughout human populations and how it kills so quickly is something scientists want to know more about. So they resurrected the virus strain and infected ferrets with it. This is what is known as a "questionable idea." Wait, is that blobby thing licking that other blobby thing? Researchers used current strains of avian flu to isolate specific genes and reverse engineer the 1918 flu to about 97%. The extra 3% is probably just screams. The hope is that animal models will help show how a disease like this spreads and allow us to better combat a deadly pandemic when it happens again. Of course if it happens again because we made it in a lab, we're going to feel like idiots right before we all die. If movies have taught us anything, it's that nature wants us dead in as many awful ways as possible. If need be, nature will send the meekest and mildest soldiers it has to lay waste to all of humanity. Have you seen the horror movie Slugs? It's about killer slugs. Night Of The Lepus (killer rabbits)? The Stuff (killer yogurt)? Well don't for one second think that mice and bees aren't on that list, because mice and bees won't just kill you in movies, they'll kill you in the lab now, too. Killer bees have been destroying B-list actors since the 1970s, and they actually have a pretty terrifying track record in real life as well. Makes you wonder why scientists went out of their way to take normal, non-murdering bees and inject them with a substance that made them straight up kill-crazy. But it happened. Using something called neuropeptides, which are just proteins in your brain that help neurons communicate, scientists triggered the kill instinct in average, everyday bees. As it is, we only tolerate bees for their delicious honey, so making them into ravenous blood-hunters is doing no one any favors. No one needs honey that bad. These probably weren't even honey bees. This experiment had no point. Scientists claim that the (alleged) point was to find out why killer bees want to kill so bad, but that's like loading a monkey's gun to find out why monkeys shoot people. "Oh, you done made me MEAN-MAD, son! You're about to GET SOME!" Not satisfied with animals that at least have "killer" in their name, other scientists turned innocent, cuddly little lab mice into stone-cold psychopaths. By fiddling around in mice amgydalas with a little genetic engineering, researchers were able to access the animals' prey drive and its desire to kill. They basically made a genetic kill switch, insofar as they were able to trigger that drive by shining a light in the mouse's eyes. One flash, and the mice would jump on prey and tear it apart. They'd even attack inanimate objects, biting at them as though they were alive. The researchers noted that they believed the effect was related to the impulse to eat -- a kind of mindless response to devour, not actually linked to any biological need for food. If that sounds like half the recipe for a zombie to you, it's because that's pretty much half the recipe for a zombie. People have been afraid of genetic experimentation since it became a thing. There's still a sizable portion of the world who fear GMO food -- hell, they even put "Non-GMO" on labels like they were reassuring customers that the food isn't made of monsters. That's why CRISPR technology has the cards stacked against it: people see it as nothing but a horror movie. In fact, the entire plot of the movie Rampage is based on that technology. In very simple terms, CRISPR lets you edit genes. Bacteria have the ability to protect themselves from viruses by creating a protein that can cut the virus DNA and disable it. We learned how to do that for any DNA using the same method. That’s what CRISPR is. Using that knowledge, you could look at the genes of your unborn child and decide if you want to fix something in utero. At first this doesn't sound terrible. What if your baby was going to have Parkinson's, for instance? If you could change those genes and eliminate future illness, that's awesome. Cure disease before it happens, that's the sci-fi world we've been dreaming of for ages, and the technology exists right now to make that real. But what if you're not looking to cure a disease? What if you just want a blue eyed baby? 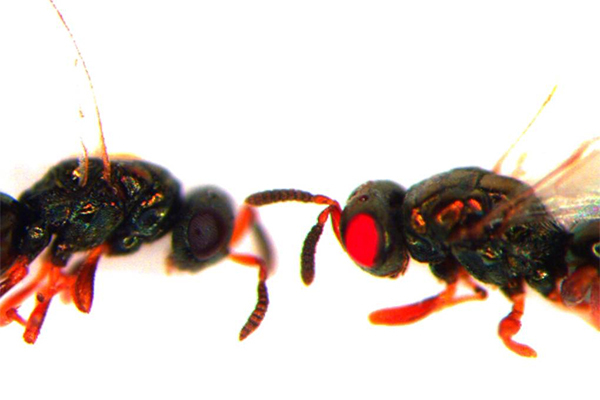 Researchers already used CRISP to give some wasps eyes as red as the devil's backside. You have to admit, though, that it looks pretty badass. Which is reason enough. Why? Because they could. Because they can do anything with genetic manipulation now. Mutant ants were created without olfaction, which means they couldn't smell, couldn't socialize, and couldn't adhere to the social structure that keeps ant colonies thriving. They all turned into a bunch of aimless, confused drifters. So how long until we make designer humans? Or custom pets that are genetically similar to prehistoric versions? Or maybe we just clip some normal genes and put in new ones from a whole new species and create a race of people who look like Grimace from McDonald's? Because that's where we're going, people. We're going to the Grimace. I'm betting that nobody wants to die in a horrible ice age mishap and get frozen in a block of ice for a few millennia. That seems like a raw deal. Equally raw but somehow worse is the fact that scientists found a way to bring back some of those frozen things that time forgot. And it wasn't just cute stuff like that guy in Ice Age who keeps wanting to eat the nut, or early '90s Brendan Fraser. No, these were 42,000 year old parasites. This is not Brendan Fraser. 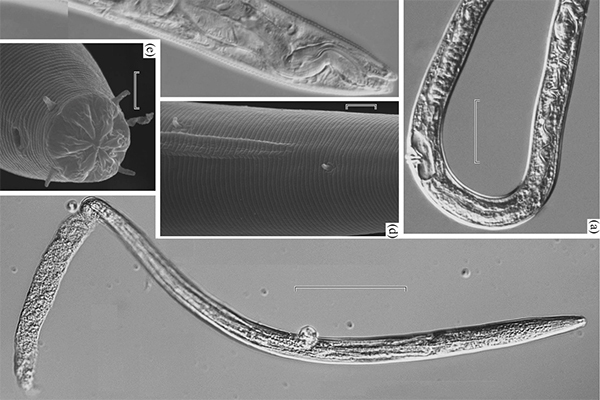 It's a 42,000 year old worm. Brendan is a wonderful person. Scientists in Russia isolated two specimens in the frozen wasteland of bad ideas and brought them to life in lab conditions after surrounding them with food and, presumably, cursed relics of the soulless. There has literally never been a single movie about unfreezing a living thing from a block of ice that turned out well. And before anyone brings up Encino Man (the aforementioned ’90s Brendan Fraser), you've clearly forgotten how that movie gave the world Pauly Shore. Do you like your brain? How about where you keep it -- are you happy with it in your skull? Most of us are. Generally, the moment your brain leaves your skull, that's it. Party's over. But man, science is not a fan of finality. Why settle for tossing old, used up brains in the trash when you could maybe just plug them back in and keep them working? Working with pig brains (because people ask fewer questions when you start collecting pig brains than if you hunt down human brains) scientists at Yale managed to keep 200 of the things working. Minus the pigs. Using heaters, pumps and oxygen-carrying liquid, the brains were kept running for almost 2 days. The researchers say there was no consciousness, the brains were just biologically living, but of course that presupposes you know what those brains were thinking at the time. And you don’t. There may not have been certain synaptic functions we relate to obvious consciousness, but if we fully understood how consciousness works we wouldn't need to keep pig brains alive in buckets now, would we? So we believe the brains weren't conscious. "Wait, you're gonna do what with my what, now?" Consciousness aside, if a brain is only alive two days, who cares, right? You can hardly take over the world as a brain in a jar in two days. Except the head researcher pointed out that they could have kept the brains alive indefinitely. They just choose not to, because you save crazy stuff like that for the sequel. The reason you keep a pig brain alive at all is because you want to understand how to keep any brain functioning, including human brains. Theoretically this could help with brain surgery and transplants in the future. Or, you know, Futurama-style heads in jars. You have to appreciate the way this seemingly goofy story is basically three horror franchises in one. You’ve got a hodge-podge of body parts being put together like Frankenstein, you've got something old sucking life force from the blood of the young like Dracula, and a dash of Human Centipede tossed into the mix thanks to two living things being sewn together. Oh, yeah, that's the creepiest part: they sewed living mice together. They call the process of sewing one living thing to another "parabiosis." In this case you get an old mouse who probably got through most of his little mouse life thinking "I'm super glad no one sewed me to another mouse" and then you get an up-and-coming young mouse who's likely thinking "I’m ready to take on the world and never be sewn to another mouse, ever" ... and then you definitely sew them together. The point here is that the two mice start sharing a blood supply, and the old mouse will actually benefit from the young mouse's youth and vigor. "You know what? I'm actually fine with just being old and slow." Lab studies have shown that the older mouse gains a number of benefits from being sewn to a young mouse: muscle stem cells are rejuvenated, as is the liver, spinal cord and brain. The young mouse, on the other hand, has no means of escaping dad jokes and a terrible new mouse wardrobe. The end game here is to see if there are any proteins in the blood of the young that could be used to reverse some effects of aging. If that could be synthesized in a lab, maybe you don't have to grow old gracefully. Instead you could stay young creepily. Of course, if it can't be lab synthesized, you can get a sewing kit pretty cheap at Wal-Mart and take matters into your own hands. But please don't do that. Like this article? Check out "Meat-Hacking Scientists: Making Beef Without The Cow" and "5 High-Tech Solutions Invented For Simple Problems".